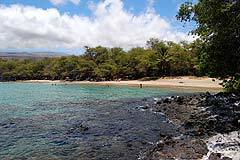 The Big Island’s beaches are concentrated along the Northwest coast. 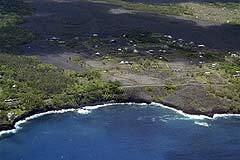 As the youngest Hawaiian island, the Big Island’s beaches are smaller than its neighbors, not having had the time to develop. 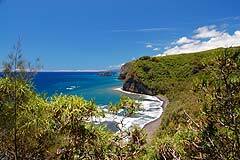 However, as our beach guide shows they are unique in their beauty and it’s a mistake for beach lovers to dismiss the Big Island. 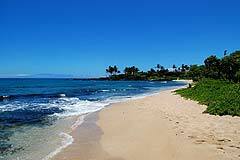 The most popular beaches are Hapuna beach and Mauna Kea beach. 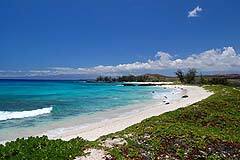 Two of the most beautiful beaches in Hawaii are Kua Bay (Maniniowali) and Makalawena beach. 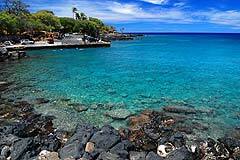 The Big Island has the best snorkeling in Hawaii because the water off the Kona coast tends to be very clear. 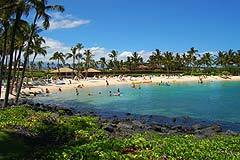 Favorite snorkeling locations include Honaunau Bay, Kealakekua Bay, Kahaluu beach park, Maikaiwa Bay and the Kapoho tide pools. 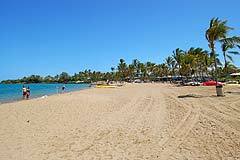 This small but picturesque man made beach fronts the Fairmont Orchid hotel. 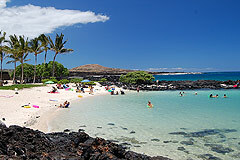 One of Hawaii's premier beaches with clear water and beautiful golden sand. 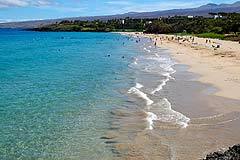 Good snorkeling when it's calm, and excellent boogie boarding when the waves pick up. 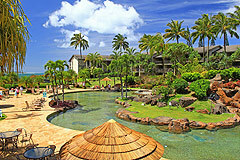 A great place to stop for a swim or snorkel with very clear water. The seal seen in the photos has taken up residence in the bay (July, 2007). 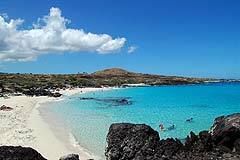 One of of the island's best beaches with good swimming, snorkeling, and sometimes boogie boarding. 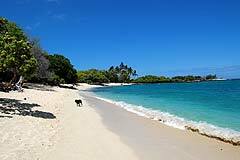 One of the more secluded beaches on the island with good swimming when the ocean is calm. 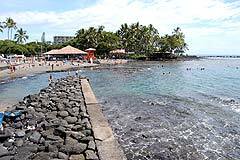 Beautiful scenary and a nice area to walk, but strong currents and a lots of rocks make it a poor location to swim. 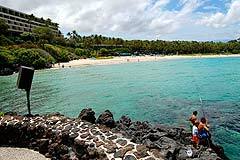 Popular with locals, the beach offers safe swimming but poor snorkeling due to cloudy water. 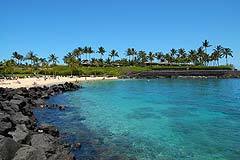 Excellent snorkeling when the ocean is calm. Crowded on weekends but suprisingly quiet during weekdays. 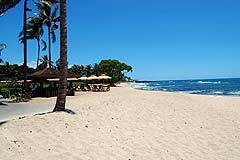 This beach front the four seasons resort. Limited swimming. 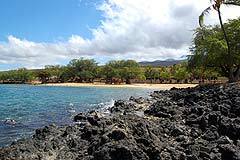 An unimpressive beach but very good snorkeling and a nice surf break to the right of the bay. 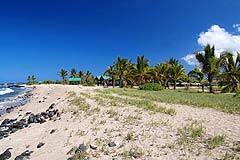 A beautiful man made beach fronting a protected bay. 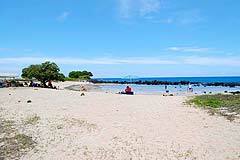 With limited parking the beach remains uncrowded. 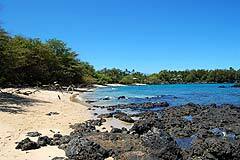 A long beach with many turtles, but rocks and murky water make it less suited for swimming and snorkeling. 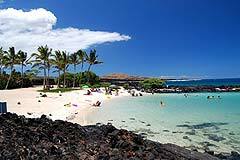 One of the few beaches in Hawaii resembling a Caribbean beach with it's beautiful white sand. Lovely swimming when the ocean is calm. Some snorkeling around the rocks. Busy on weekends. 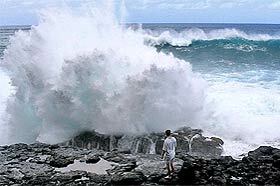 A popular picnic site, the beach and ocean here are less interesting. 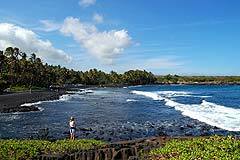 Farther to the north is good snorkeling (in the panorama, the fisherman facing 2 small snorkel tour boats marks the location). Good boogie boarding when the ocean co-operates.